Those Sugar Plums, the ones that dance in the head during the long winter slumber in the most familiar Christmas story that’s likely ever been written. How did I get to be this age, with a teenager and a husband, long gone away from treasured annual reads of that classic story each year, the retelling of Santa’s magical visit, and not have any clue what a real sugar plum entailed? I want to kick myself. Because, I’ll tell you something, and this is no small truth. Had I known about these delightful, sweet and simple little treats prior to this past week, how easy they are to put together and how eager and surprised everyone looks when you pull out a container and say “These are Sugar Plums. Yes! THOSE Sugar Plums!” I’m telling you, it would be all I need and I’d have been cranking out these nutty fruit-filled, orange-scented orbs the moment the calendar page flipped over to the month of Christmas. My hope now is that I don’t go so far into overkill that I never want to see a dried apricot again. The delight and flavor and simplicity of these might possibly have that effect on me. Good thing Christmas is just a few days away. It’s a bit embarrassing, really, to be so interested in food of all kinds, the history of it, the stories it can tell and not be aware of this confection. But that’s what we have friends for, isn’t it? To enlighten us? To share the wealth? And little could be simpler than combining rough-chopped nuts and dried fruit in a food processor along with honey and orange juice and whirring it all into an utterly fragrant crush of flavor. Even the rolling of the mixture was contemplative, as the sun warmed my backside and Miles Davis kept me company with his sultry trumpet. A late afternoon of putting together a Christmas fiction and ballet classic that I know I will love for years to come left me feeling a lot more festive than I have been lately. With the addition of a fragrant tree, dragged through a snowy wood, and boxes filled with a lifetime of memories and nostalgia also added some much-needed holiday spirit to my life. If all I need to do that is a few packages of dried fruit and some bags of nuts, then holidays from now on could become much more simpler. One can only hope, anyway. 4. 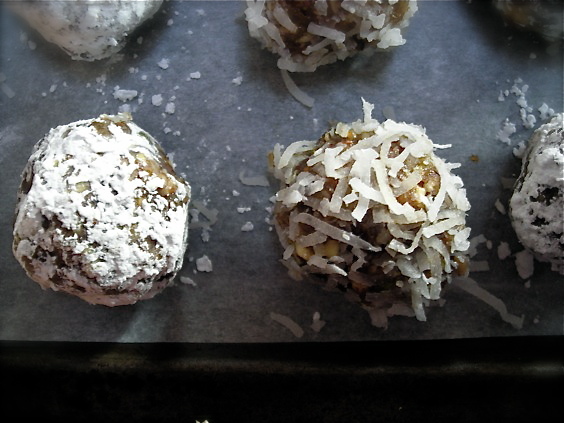 Pinch off pieces of the mixture and form into 1-inch balls. 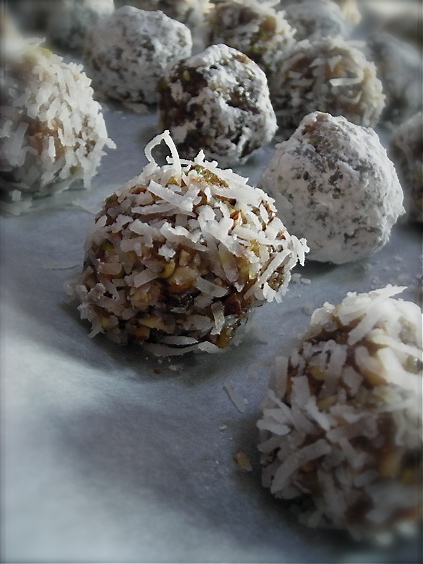 Roll in coconut. Place on the baking sheet and chill for about 1 hour until firm. 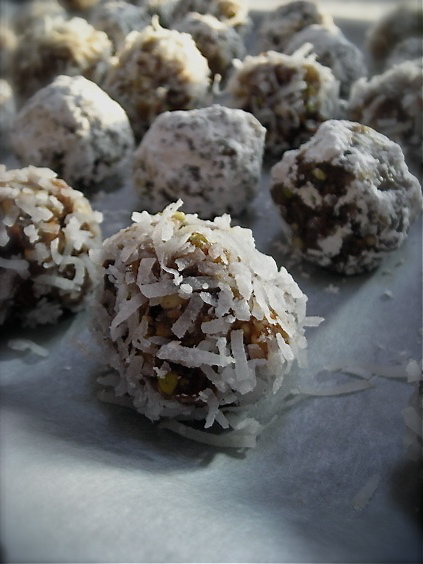 I used two cups equivalent of nuts, utilizing pistachios and pecans as well as almonds. It’s my holy trifecta of nutty favorites. I might have used figs in place of dates, and on another go-round of this recipe, I probably will do just that along with dried cherries. The possibilities are endless for substitutions. Use raisins both black or gold, dried cranberries, currants, pineapple, mango. Other nuts like peanuts, walnuts, brazil nuts. Try it with lemon juice and zest for a different background of flavor. I also added a teaspoon of ground nutmeg to the mix. Cinnamon and nutmeg are culinary best buds. They really get along so well together that it’s a shame to leave one out when the other is present. I added a bit more honey and orange juice, as the amount in the recipe didn’t seem to be enough to make the mixture as sticky as it needed to hold together. Adjust it according to your taste preferences. Love the idea of these…and so easy too! Perfect holiday gifts I will keep in mind for next year. Thanks so much, Kate, for this and all your recipes. I’ve found some treasures here. Tasty-sounding recipe. We’d go with dried cherries, but that’s just our two cents! oh how tenderly! have a merry, wonderful and white christmas!!! I’m right there with you! How could I have gone this long in life and not indulged in these holiday treats! I just made some the other week. Holy YUM! miles davis and sugar plums together? now, that sounds like a very good day. merry christmas to you and yours, kate! I now have visions of sugar plums dancing through my head. Thank you, Kate:) It’s just what I needed this holiday season. Darn, just used the rest of my dates for energy bars. Luckily I can always pick up some more. Consider this bookmarked! I’ve always wondered what a sugar plum is. They make me think of The Nutcracker Ballet. Oh yummy!!!! I had no idea that’s what they were either but now I want to make them too! They look wonderful!!! !